Buyer Purchases Other Products? You STILL GET 50%! Want To Earn Solid Commissions On A High Converting PROVEN Product Your Subscribers Will Thank You For? You Earn 50% For Every Buyer You Introduce!! PLUS We Give You Lots Of Marketing Materials & Support! Our success depends on YOUR success...In other words, we want you to be successful! So we give you lots of support and opportunities to make additional profits with our products! 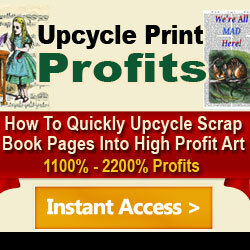 We have just introduced a brand new high quality course called, “Upcycle Print Profits!” that sells like wildfire for $24.97 – This quality course shows people how to earn and grow consistent profits on Etsy - We have designed this course to be in depth, yet easy to follow so that both complete newbies and experienced Etsy sellers can benefit. This course is particularly attractive to ebay sellers whose sales are suffering as a result of ebay's new search engine. – PLUS 50% of the upsell sale $19.97 - and there's more! your prospect buys at ANYTIME IN THE FUTURE, you STILL GET PAID! – The LIFETIME COOKIES are also GLOBAL which means even if your buyer purchases a DIFFERENT product (from us) than the one you are promoting, you STILL GET PAID! PLUS, in the future, we will be creating additional products each paying 50% commission that we will notify you of as they come out. Our marketing strategy works because we build strong relationships with buyers by delivering additional free advice, hints, tips and updates over several weeks. This virtually eliminates refunds as this approach delivers far more value, reassurance and support for the customer. As a result the total potential commissions per prospect is much higher than with other products in this price range which means HIGHER earnings for YOU! This product is a step by step in depth yet easy to follow course (with bonuses) that shows people how they can start and grow a profitable ETSY business that they can be proud of. Everything is covered from how to find a profitable niche to how to create desirable products. The sales page has been professionally written for maximum conversions - You can see the sales page here. All new affiliates will be paid direct to their PayPal account 30 days after the sale to allow for any possible refund requests. Established affiliates with a JVZoo sales track record will receive instant commissions on all sales directly to their PayPal accounts. Either way, it's money in the bank for YOU. Just follow the instructions below and earn CASH for every buyer you introduce! 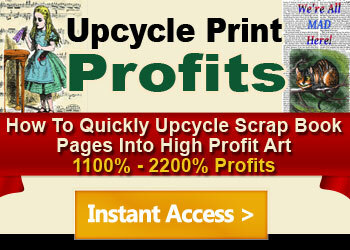 Making money with Upcycle Print Profits is very easy. 1) If you don't have one already, get a FREE JVZoo Affiliate Account by clicking here. 2) You'll need to request approval to promote Upcycle Print Profits, which you can do by clicking here. (All requests will be approved within 24 hours). JVZoo’s lifetime cookies will ensure you receive full credit for every product sold to the buyers you introduce! Copyright © Upcycle Print Profits . All Rights Reserved.